It arrived on Friday and I was surprised to discover two things about it: First, it was marketed by the Palestine Typewriter Company, with branches in Tel-Aviv and Jerusalem (and elsewhere), whose decal was on the front. Also, it is some sort of specialist typewriter, perhaps medical or science, with some strange keys on it. The MLS would stand for milligrams, I presume, but I’m not sure what the LP key, or the one with an upright stroke and a figure one over a backstroke, are for. POSTSCRIPT: As you will see in the comments below, follower Scott Kernaghan has solved the mystery - it is a Palestinian banking typewriter. The LP stands for Palestinian pounds. Scott points out the old Palestinian pound was broken up into units of 'mils', and each mil was 1/1000 of a Palestinian pound. Thank you, Scott! 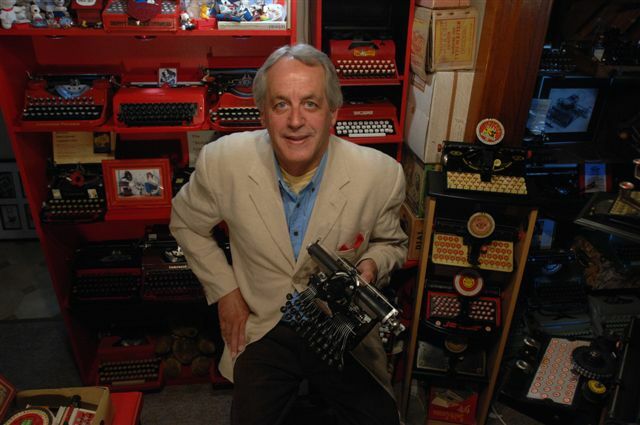 "What I think you're looking at is a typewriter used by British banks or government - pre-World War II," wrote Scott. "I'd dare say that this unit was used to log currency exchanges, or accounting between British firms and Palestinian interests." Figure 1 over a back stroke is there to make your own fraction. One more comment if you don't mind, or, rather, guess. I think 'mls' might be better read as "milliliters". The vertical stroke on the "make your own fraction" key might be for drawing vertical lines as we have an underscore for underlining horizontally. If it's not that, then it looks like the logician's Sheffer stroke, writing P|Q means -(P&Q). "LP" if it doesn't mean "long playing" still mystifies me. Thanks Martin. I don't mind at all, other that I should be in Cologne picking up your Oliver! Yes, I figured the 1/ was a make your own fraction, but wouldn't it look rather awkward when typed? The LP also has me mystified, as I have looked at various medical LP terms without finding one that might fit the bill for presumably regular use. I don't know about the others, but Marty may be right about milliliters. It's not medical. I'll tell you that now. There would be no rational reason for a 'Lumbar Puncture' abbreviation key, and there's no pharmaceutical term to match it. I can say this with certainty, as I am writing to you from a computer in the bowels of the hospital that I work in. However. As a coin collector... I can tell you something else. What you are looking at is a machine for banking. Probably in the middle east. The old Palestinian pound was/is broken up into units of 'mils', and each mil is 1/1000 of a Palestinian pound. These are often broken into units of 1/500 (half a pound) etc. Where things go a little askew here, is that the Palestinians never used the pound symbol (that I am aware of) to denote their pound. However the Egyptian pound is denoted with the LE abbreviation, implying that the Palestinian Pound (a more or less dead currency) might have been abbreviated with LP. What I think you're looking at is a typewriter used by British banks or government - pre world war 2. I'd dare say that this unit was used to log currency exchanges, or accounting between British firms and Palestinian interests. Modern day Palestine is a very different place, and the British involvement and governmental influence isn't what it used to be. Thank you so much Scott, this is brilliant work. Yes, I just checked and LP is the Palestinian pound all right. Well done you! I think this is a mystery solved then! I'm jealous. This is the kind of thing I love most about old machines like these. On this occasion there's a few telling hints about the secrets of its past. Great find. Hi Scott. I have added a postscript to the post to point that out. Again, my heartiest thanks. No need to be jealous - when you come to Canberra for the exhibition, you can collect the Bijou and take it home with you as a gift from me. I think four Bijous and also three versions of the Erika Model 5 are quite sufficient for me! I'm not sure what to say! I'll have to give you something in return. But what do you give a man that has so many typewriters that they are in storage! Something to think about. Have a great day Rob. I'd better get some work done.